With this third in a series of posts about great hikes with children around the Northeast, we travel to Connecticut. The 4 walks described here include a classic summit, child-friendly geology field trips, and uncrowded walks along Long Island Sound. Each hike offers an enjoyable and educational outdoor adventure for children and adults alike. 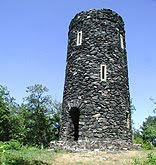 Mount Tom, Litchfield. “If you seek lofty views with minimal effort, this short hike is for you,” write René Laubach and Charles W. G. Smith in AMC’s Best Day Hikes in Connecticut. The trail to the summit starts in Mount Tom State Park and follows yellow blazes through oak-dominated woodland, reaching the summit (1,295 feet) after 1 mile and approximately 400 feet elevation gain. Trail quiz: Identify 4 kinds of birches (white, yellow, gray, and black) and 4 rocks or minerals (schist, gneiss, granite, and hornblende) along the trail. Hint: You’ll find hornblende, a dark, lustrous mineral blend, in the stone observation tower at the summit. Chatfield Trail, Killingworth. Young geologists (and the adults who love them) will find much to enjoy on this moderate hike (2.6 miles roundtrip, 135 feet elevation gain) through Chatfield Hollow State Park. Geological features are easy to spot, including ledge outcrops, banded rock cliffs, shallow caves, and glacial erratic boulders. Native Indian artifacts discovered in the area suggest that the overhanging ledges and boulders fields may have offered refuge and gatherings spaces. Pick up a map at the park entrance. There are many trails; you want the blue-blazed Chatfield Trail. Hammonasset Beach State Park, Madison. This busy public beach, the biggest in Connecticut, quiets down after Labor Day. Three short trails, each about 1 mile in length, traverse different salt-water habitats, letting you choose whether to explore a salt marsh, the rocky shoreline, or sandy uplands. Several wooden platforms offer prime viewing for the fall bird migration — snowy egrets, tree swallows, warblers, cormorants, and many species of hawks, among others — and the 2,000-mile migration of monarch butterflies to Mexico. For the best viewing, go on a clear day when the wind is out of the northwest. Denison Pequotsepos Nature Center, Mystic. A natural history museum, nature center store, and wildlife sanctuary make this privately owned 300-acre preserve a good choice for those days when the weather is unsettled — or stormy tempests are brewing in small bodies. When the weather is good, follow intersecting loop trails for a level 2.3 mile ramble past ponds, ledges, and woodland forest. Outdoor flight enclosures contain barred and great horned owls, peregrine falcons, red-tailed hawks, and other raptors. My next post in this series crosses over into New York, with hikes in the Catskills and the Hudson Valley. Before that, though, I’m going to sneak in a post on another topic I’ve been thinking about since school started. . . .
You can find detailed descriptions of these hikes in AMC’s Best Day Hikes in Connecticut by René Laubach and Charles W. G. Smith.